Lambri Trek: Travel along a holy mountain. Let your mind encompass the entire Himalayas. Lambri Trek is a moderate trek with a unique significance. It is not in the GHNP but there is no better view of the Park than the view from Lambri. Lambri stands like a guard of the higher Himalayas. From the top you can see the whole Himalayan range from the Dhauladhar range to Kinnaur. Stunning! It is not a protected area but the biodiversity of Lambri is exceptional. It even shelters the Western Tragopan. Lambri is inhabited. There are a few villages on its sides but the villagers consider their mountain like a temple. It is the abode of the most powerful and merciful deities. 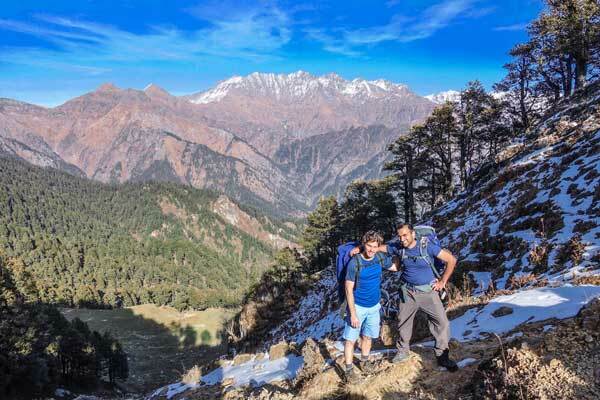 On Lambri Trek, you are actually not a trekker but a pilgrim! If you start from Jalori pass (3150 m) you save yourself the tiresome climb to the Lambri top (3600 m) from a low altitude. Stamina : The physical effort involved during your trek. Rated from 1 (easiest) to 5 (most strenuous). If you have an average fitness you can consider all treks below 4. Technical : Difficulty of your trek in terms of exposure to danger and required experience. 1 : no difficulties, 2 : walk on good mountain trails, 3 : some walk on difficult mountain trails (steep slope, rocks, etc. ), 4 : you are exposed to some dangers (void, snow, falling rocks, etc. ), 5 : Experience required (please inquire). 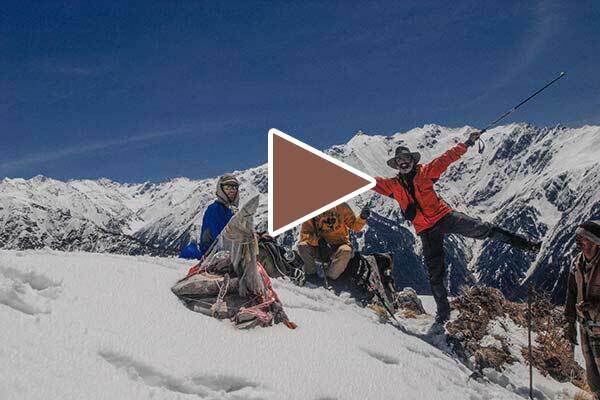 Lambri trek goes all over the ridge of a long mountain range just front of the Great Himalayan National Park. It is a very scenic trek. You need to go to the trek starting point (Jalori) by jeep with your staff and equipment. Best time to trek to Lambri is April, May, June, and then October and November. You may also consider July, September and December. The trek starts from Jalori pass. It is advised to reach the region the day before. From your guest house you have to take a jeep up to the pass. 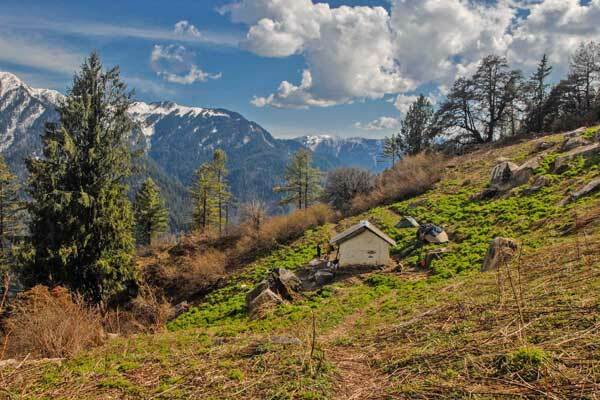 In order to reduce the road trip you may consider a guest house or homestay not in the Tirthan valley but on the way to Jalori pass. Jibhi, Bihar, or Sojha are good options. Jalori pass is located at 3130 m height. Whatever the season you will feel a big drop of temperature when reaching Jalori. The day 1 is quite relax and very pleasant. Jalori pass is a spectacular spot itself and the road towards the pass is quite an experience ! Have your packed lunch at Jalori pass or after a little walk in the forest. This afternoon you just have to walk towards the locally well-known Serolsar lake where you will have your first camp. The trail is gently weaving through a magnificent oak forest. No difficulties for today, the path is smooth, well maintained and without steep slopes. In the evening you have a choice of camp site : A small beautiful lake before Serolsar (see the photo below) or a nice meadow after Serolsar. Enjoy your time by the bonfire and your first dinner in the wilderness. Lie in the grass, open your eyes and let your soul navigates in between the stars. Good night. After a copious breakfast everything is packed and you start your second walking day. Today will be a bit more “mountainous” ! From the camp you climb towards the ridge that you will follow for the next 3 days. The slope is not too steep and the view is worth the effort, isn’t it? Don’t worry nothing strenuous here and the trail goes on winding on the ridge offering you amazing views of the Himalayas. Let the Lambri energy to take you to the next camp without realizing that you have travel a great distance at more than 3000 m above sea level. You camp in a meadow at the bottom of the mountain ridge near a small shepherds hut. Today is the day ! Don’t hesitate to help your trekking crew to pack up the camp before and after the breakfast to have more time to enjoy Lambri. You reach the crest again. You continue walking towards Lambri. There is no more forest but high altitude pastures. Provided the weather is good you will spend most of your day enjoying the view of the Himalayan ranges. Dhauladhar range where the Tibetan community has taken refuge, Pir Panjal range with its fascinating peaks : Hanuman Tibba, Deo Tibba, Indrasan and so on, the entire Great Himalayan National Park is just before your eyes, and on the right (East) lies clearly the mountain range of Kinnaur. Before reaching Lambri you will have to remove your shoes. Why ? Because the top of the mountain is as sacred as a temple. On the way before Lambri think of collecting a few flowers that you can offer to the Gods at the top of Lambri. After Lambri you have a comfortable walk towards Skirn, another small summit where there is a “real” temple made of wood. Meet the priest who lives there outside the snowy season. Lambri and Skirn are very famous holy places among all the people of the Kullu valley, the valley of gods. You go down for half an hour and reach another meadow : Chanan Thach where you will have your last camp. Feeling like touching the Himalayan peaks. Here the Pir Panjal range. Today you just have to descend to the last stage of your trek, the village Bihar. The forest is really fascinating. It shelters numerous pheasant and large mammals. Before reaching Bihar you can ask your guide to have a short visit to the village Chehani Khoti where lies an impressive medieval watchtower. Staying at the Bihar village is a good option for this evening. The lonely priest/guardian of Skirn temple happy to have some visit. This itinerary is not going through Skirn. Day 1 From Jalori to Serolsar. Day 2 From Serolsar to the Shepherd's hut. Day 3 From the Shepherd's hut to Lambri and then the beautiful campsite of Sarthi. Day 4 From Sarthi to village Ghyagi. Day 1 From village Bihar to Chanand Thach or village Bashir. Please note that near the Bashir village there are some caves where quartz crystals are found. You can ask your guide to visit them. Day 2 From Bashir to Lambri and then Chanand Thach via Skirn. Day 3 From Chanand Thach to village Bihar.